Meet the textured sister of the Sisal Stitch: the Seagrass Stitch! (See full details and videos of both stitch patterns in this post.) This stitch has a natural slant to it depending if your are whether you work it to the right or left. 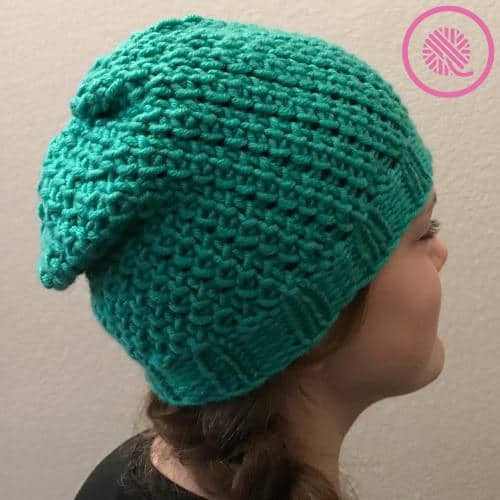 The Seagrass Slouchy Beanie quickly knits up in the round as a woven spiral and looks fantastic in the reverse as well! This quick knit pattern works up in no time in a stitch that resembles natural seagrasses in the ocean. This pattern is perfect for beginner knitters because the seagrass stitch is easily worked in the round. 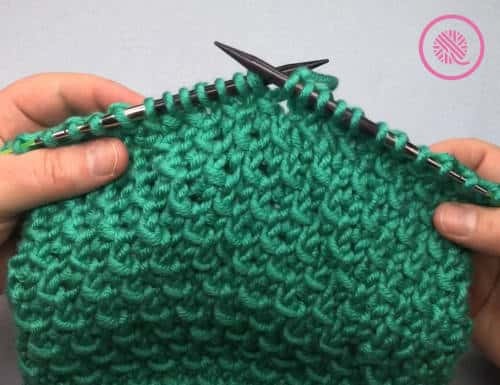 You will need to know how to connect in the round as well as purl for the brim. 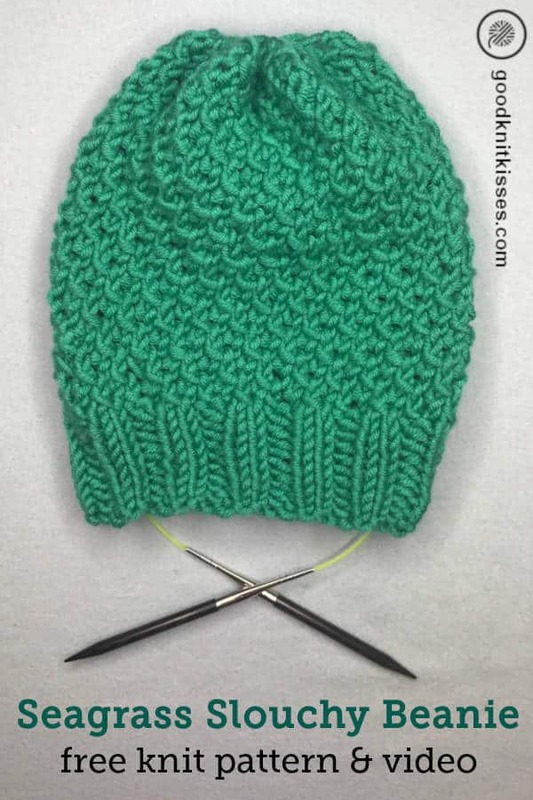 The Seagrass stitch pattern is demonstrated in a video tutorial. Grab the companion pattern for the Sisal Cowl or the Sisal Scarf for a unified look. Both stitch patterns have a distinctly woven look that you’re sure to love. Loom knitters, see the Loom Knit Seagrass Slouchy Beanie or Loom Knit Sisal and Seagrass Stitches for you versions. A PDF download of this pattern is available on Ravlery.com. Premier Everyday Bulky (100g / 3.5oz, 80 m / 87 yards) 1 ball. Color Mint used in sample. US 10.5 (6.5 mm) 16-20” circular needles. Knitters Pride Dreamz Interchangeable Needles used in sample; use DPNs or magic loop as needed for brim. 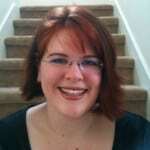 If substituting yarn; use needles approximately 2 sizes smaller than recommended on yarn label. Knit BO = Knit Bind off – Knit 2 stitches, lift 1st stitch over 2nd to bind off. Thumb CO = Thumb Cast On – also known as an ‘e-loop’ or ‘backward-loop’ cast on. A simple cast on which twists a yarnover in the opposite direction. Do not substitute for another cast on. Beanie is worked in the round. I recommend the Longtail cast on, but you may use another cast on method if you prefer. To change yarn or needle sizes cast on a multiple of 4 for best results on stitch pattern and brim ribbing. Main stitch pattern is a multiple of 2. Cast on 48 sts, PM and connect in the round. Rnd 1: *K2, P2 rep from * to end of rnd. Rep Rnd 1 eight more times or until desired length of brim. 2” (5 cm) brim shown in sample. Rnd 1: *Knit BO 1, Thumb CO 1 rep from * to end of rnd. Do not overtighten. Rnd 2: K all sts. Rep Rnds 1-2 until knitting measures 9” (76 cm); end after completing a Rnd 2. Break yarn, leaving a long end. Thread end through rem sts and draw up tightly. Fasten securely. Weave in tail carefully.